This edition includes the approved New American Bible text (with Revised New Testament and Psalms) for Catholic Liturgy. The Catholic Mission Edition is unique because it contains the Dogmatic Constitution on Divine Revelation. Known in Latin as "Dei Verbum" or "Word of God" this vital teaching document characterizes the Catholic Church's guidance on reading and interpreting the Word of God. 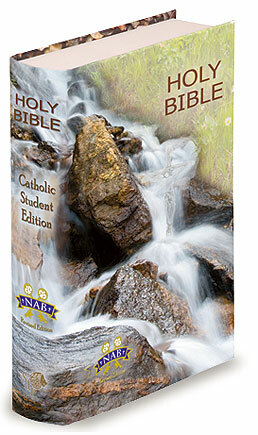 This edition also includes: What Jesus Said About Everyday Topics, The Election of the Pope, How To Pray the Rosary, What Happened to the Twelve Apostles, Bible Dictionary, Three Year Cycle of Readings, Index to Scripture Atlas and Maps, and Page edge Indexing.New American Bible (NABRE) - Catholic Student Edition.1617 pages.